Back on our boat, we still had time to visit Apuao Grande Island, the most famous of the 7 islands. Located 10 kms. northeast of Daet and a 45-min. boat ride from Mercedes, we again made landfall at a beautiful stretch of white sand beach. The island also has agoho trees (an evergreen species of trees that look like pine trees), mangrove forests, a sandbar and a steep cliff (ideal for rock climbing) on the Pacific side. Apuao Grande Island was also once home to the once high-end TS Resort, formerly operated by the Australian-run Swagman Hotel chain. At its heyday in the 1980s, it had 30 non-airconditioned cottages with bath, a restaurant, beach bar, swimming pool, tennis court, gym, sauna, a 9-hole golf course and an airstrip. Now abandoned due to lack of marketing push and typhoons, most of the solar-powered villas are leased to many expatriates who want to stay on the island. 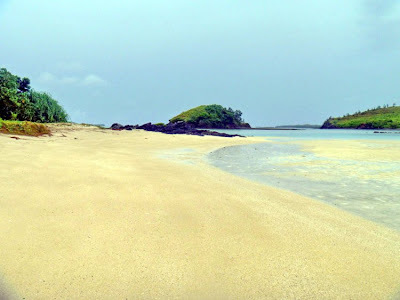 From Apuao Grande Island, we crossed over to the 24.29-hectare Apuao Pequena Island (also called Apuao Munti Island) which is connected to Apuao Grande Island by a land bridge (during low tide). It wasn’t low tide yet, but somehow we managed to cross to the other side despite the somewhat strong current. 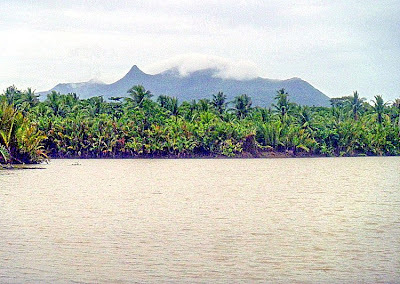 The island has a 350 m. long shoreline, a 150-ft. high mountain and a campsite. We didn’t have time to visit Caringo Island and Malasugui Island (the smallest of the seven) and their white sand beaches and, thus, we again boarded our boat for the return trip back to the mainland. The perfect time for visiting these islands is from late March to early May. It was such a pleasant surprise to see how beautiful islands such as these have been kept from the national tourism spotlight for so long. Maybe, next time, they’ll take notice. The Pinyasan Street Dancing and Marching Band Parade, along Vinzons Ave., had now passed us by and, before leaving, Lee, TJ, Bernard and I decided to drop by the two-storey, maroon and white Rufino Pabico ancestral house, the only remaining relic of early 20th century architecture in Daet. On hand to welcome us was the 75 year old Francisco Pabico Temoner, the grandson of the original owner. Mr. Temoner, I would later learn, is a retired General Manager of the Camarines Norte Electric Cooperative (CANORECO) and a acquaintance of my father-in-law, Mr. Manuel L. Sta. Maria, retired Deputy Administrator of the National Electrification Administration (NEA). Built in 1917 and the scene of high-society balls in the 1930s, the grand Rufino Pabico house was still well-preserved. Within its well-manicured front yard is an octagonal fountain. Like many typical bahay na bato (stone houses), it has a masonry ground floor and a wooden second floor. 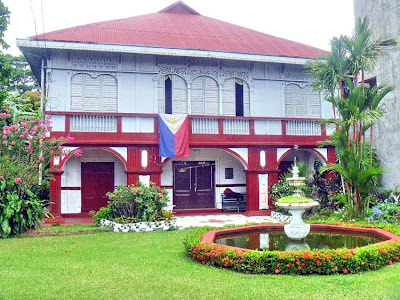 Arches are predominant in front; from the ground floor colonnaded front porch, with its fluted square columns, all the way up to its second floor sliding capiz (oyster shell) windows, its arches decorated with intricate lacy (calado) woodwork. That same woodwork can also be found above the windows and in the eave fascias. Between the window sill and the floor are ventanillas with sliding wooden shutters for additional ventilation. The interiors are just as well preserved. The grand stone staircase, with its marble steps, still has its rococo-style carvings while the alternately dark and light-hued hardwood floor still retain their shine. The ceiling is covered with wood carvings. All these are complemented by a Cornish piano, pre-war chandeliers, wall paintings, vintage family photos and antique wooden furniture including silohiya (wickerwork)-covered chairs. Novelties here include a now-unused wood-fired stove and a free-standing antique, enamel-covered cast iron bathtub. 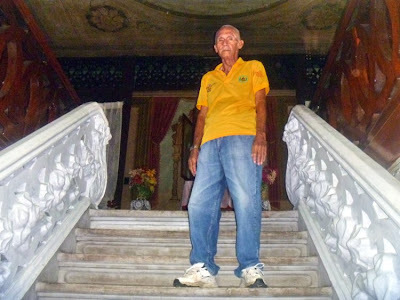 According to Mr. Temoner, during World War II, the house was used as a headquarters for the Japanese Imperial Army and, later during the Liberation, by American forces. 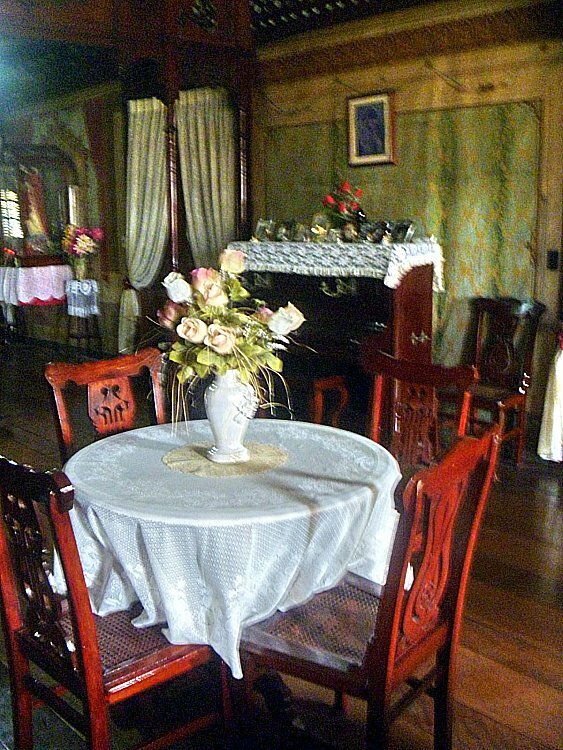 In 1995, a strong typhoon partially destroyed the house but it was soon restored to its original look. The house hit the limelight when it was featured in an article at the Philippine Daily Inquirer, written by our media colleague Amadis Ma. Guerrero. 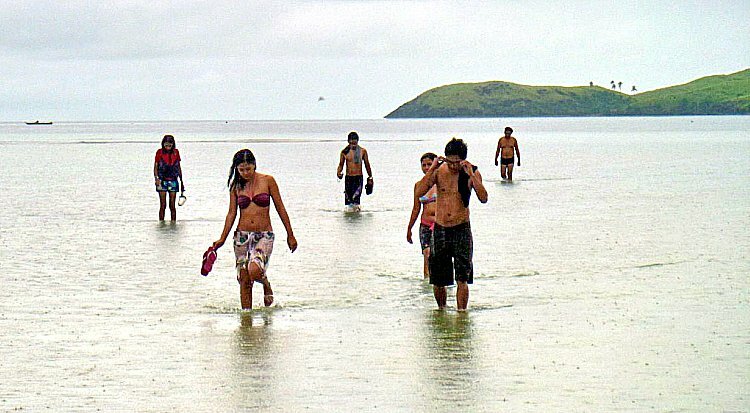 Since then, it has been included in the list of places to see in Daet as well as in the province. On June 19, 1997, the house was conferred the “Provincial Cultural Treasure Award,” as indicated by a plaque installed at the porch wall. 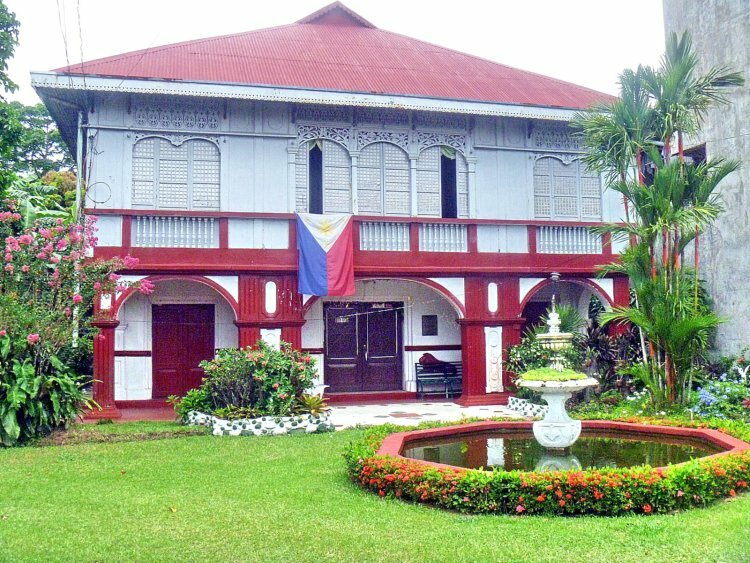 During the 2009 Pinyasan Festival, the Daet Kiwanis Club, the Daet Senior Citizens Federation and Reina Daetena hosted the Grand Tertulia de Daet at this house. 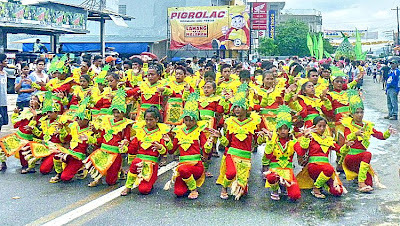 One of the highlights of our last visit to Camarines Norte (aside from the Pinyasan Festival) was the celebration of our National Hero Jose Rizal’s 150th birth anniversary. 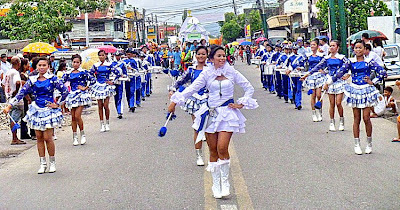 Daet figures prominently in this nationwide celebration because it is the site of the first and oldest monument erected in honor of Rizal (though he never set foot in the town) in the country (antedating, by 14 years, the more famous one built in Luneta in 1912) and in the world. Last June 19, some 1,500 youth of the province, all belonging to various schools and organizations, joined a mass floral offering at the First Rizal Monument, all vowing to keep the libertarian ideals of Rizal alive and to help contribute in nation-building. 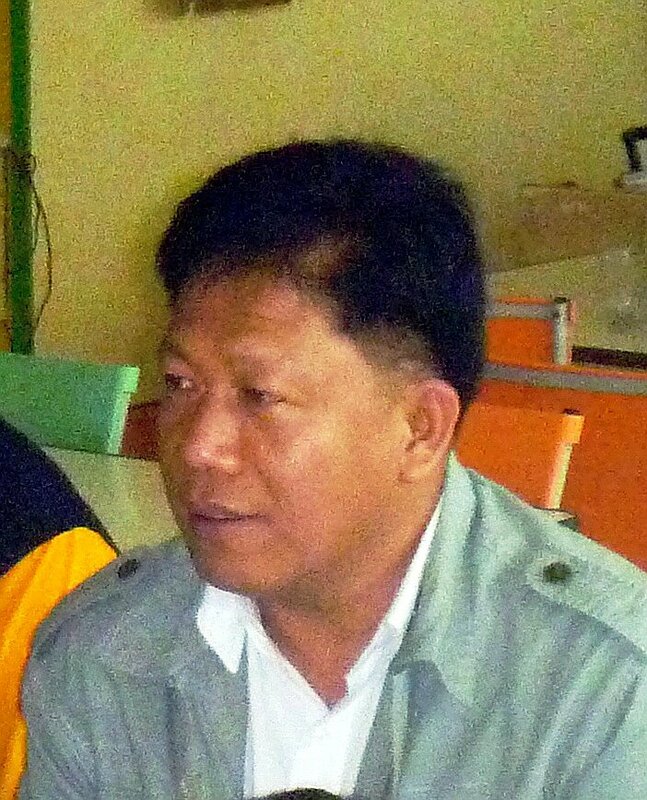 A history forum, with Prof. Danilo M. Gerona of the Ateneo de Naga University, was also held there. The monument, at the corner of Justo Lukban and Magallanes Iraya Sts., at Rizal Square, Kalayaan Park (the park was said to be the site where the Katipuneros held their ground during the April 14-18, 1898 uprising), in front of the old municipal hall (now the Daet Heritage Center), is a 3-tiered, 20-ft. high stone pylon designed by Lt.-Col. Antonio Sanz, a soldier-artist and revolutionary head of the local government, and Lt.-Col. Ildefonso Alegre. It was built through the financial contributions of the townsfolk of Camarines Norte and the Bicol region. Oral accounts say that the base contains a time capsule containing the list of contributors to the project while some quarters and treasure hunters believe that there were buried treasures around it. 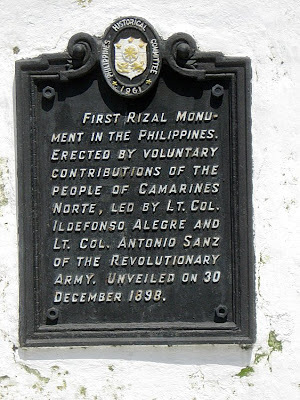 The groundbreaking for the construction of this sparsely decorated but impressive and majestic monument, near the bank of the Daet River, was done on December 30, 1898 (just two years after Rizal’s death), in observance of the first-ever Rizal Day (the first province to do so), decreed on December 20 by then Pres. Emilio Aguinaldo, and completed sometime in February 1899, shortly after the outbreak of the Philippine-American War. Its foundation is believed to have been made with mortar and coral stone taken from the demolished old Spanish jail where many patriots, in April 1898, were tortured and executed. 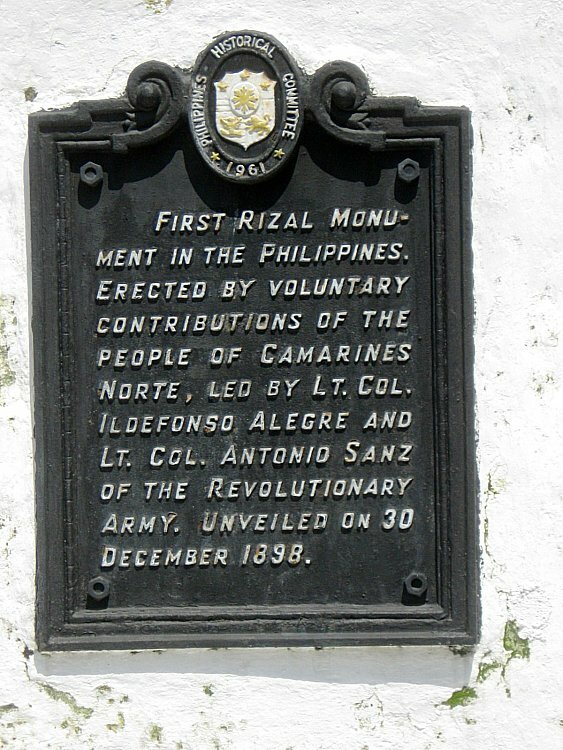 The monument is rather unique as it does not bear a sculpted image of Rizal, unlike other monuments today. Inscribed on the square podium, surmounted by a two-level triangle (the last one tapering off to a point), are Rizal’s popular novels, “Noli Me Tangere 1886” and “El Filibusterismo 1891,” and “Morga 1889,” a tribute to Antonio de Morga, author of Sucesos de las islas Filipinas, an important book on the Spanish colonization of the Philippines written in 1609 and later annotated by Rizal. 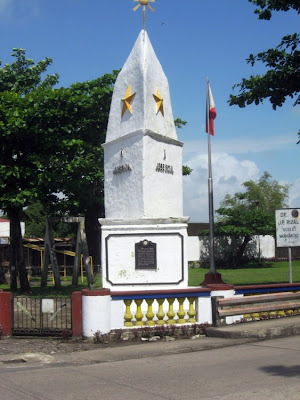 Ironically, the Rizal Monument came to be known as “Morga Monument.” On the sides of the triangle is a five-pointed star, an eight-rayed sun and the Spanish phrase A Jose Rizal (“to Jose Rizal”) and at the top used to be the all-seeing eye. The front face contains a black metal plaque, from the then National Historical Commission, declaring it a National Historical Landmark in 1961. 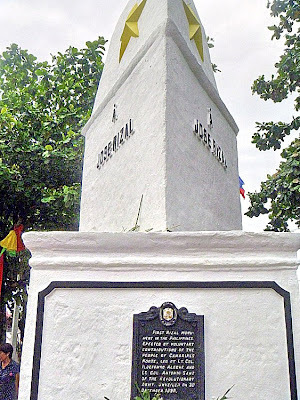 The monument has pronounced Masonic elements possibly because Rizal, Emilio Aguinaldo, Sanz, Gen. Vicente Lukban (head of Revolutionary forces in the Bicol Region) and many of the financial contributors were Masons. Today, the image of the First Rizal Monument is incorporated in the provincial and municipal (of Daet) insignias. While we dining on the boat, we were merrily on our way to our next destination: the low, flat and heavily wooded, 6-hectare and footprint-shaped Quinamanukan Island, off Brgy, Sula in San Miguel Bay. We were within sight of the island and its 1,000 m. long white sand beach by 1:30 PM but we had to circle it for half an hour, looking for a suitable landing site, with the boatman carefully steering the boat away from the delicate coral reef. We were welcomed by Mr. Samuel Pajarin, the island’s caretaker, who led us to his hut on the island’s opposite shore, we having to make a short hike through a well-marked trail through a forest to get there. While Samuel was making coffee for us, I donned a diving mask and snorkel to explore the stunning and impressive submarine gardens (stony, whip and soft coral, black coral, etc.) of the island’s 200-hectare marine sanctuary, a breeding spot for different kinds of colorful tropical fish. The island is also ideal for scuba diving as it has drop-offs going down to 1,000 m.
After returning to our campsite from our hilltop trek, we proceeded to pack up our stuff as we were to have our lunch at the mainland in Vinzons town. We shoved off and said goodbye to Tinaga Island by 11 AM but it seems our hunger for islands to explore hasn’t been sated. With some extra gas to burn and lots of enthusiasm, in spite of the overcast skies, we leisurely made our way to the privately-owned (by a Dr. Valencia) Pinagkastilyuhan Island (also called Cinastilyohan Island), making a brief stopover to photograph some goats sheltering on rocky outcrops on another island. After a 30 min. trip, we made soon espied Pinagkastilyuhan Islandbut couldn’t make landfall as the water was too shallow for the boat to navigate. Thus, we had to disembark from the boat some distance from the shore, me, Bernard, Karla, Lan, Debbee and Angel having to wade through ankle deep to sometimes waist deep waters to get to shore. It was already drizzling when we arrived, prompting Lee decided to stay behind in the boat to avoid drenching his camera. I was the first to make it to shore, the others soon following my lead. The sand, though not as white as in Mahabang Buhangin, was just as fine and inviting. However, prior to exploring the island, Debbee had to get clearance from the island’s lady caretaker, it being a privately-owned island. We went maybe a fourth of the way around the island, where two islands beckon offshore. The nearest seemed reachable but wading towards it was impossible as, halfway there, the water already reached up to my neck. So near yet so far. After some photo ops, we returned to where we landed and waded back to the boat. While we were gone, Lee wasn’t idle, buying 5 large pieces of fish and a squid, from some passing fishermen, for the rock-bottom price of PhP100. 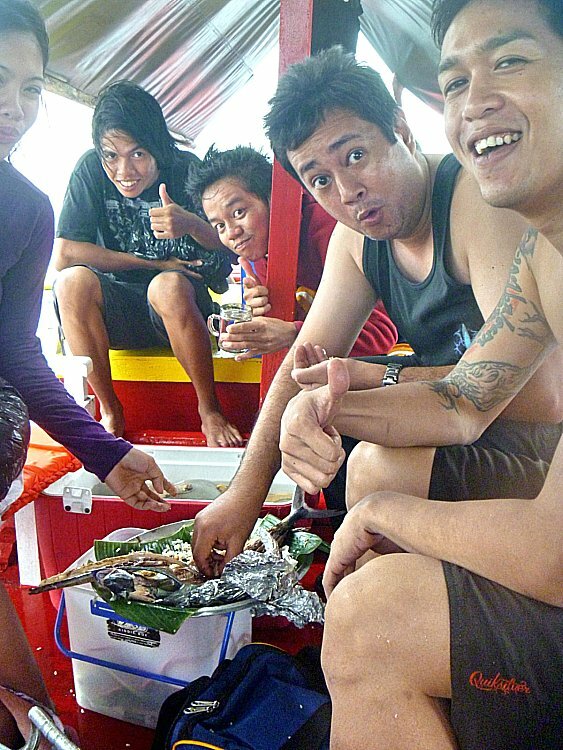 As soon as we raised anchor, Lee had this fresh catch grilled by the boatmen on a portable stove. It was now noontime and time for lunch and, soon enough, we were dining on this feast, kamayan style, which we complemented with leftover fried rice. Our longest stopover was at the Church of Our Lady of Candles in Paracale, my second such visit. However, my visit here was notable as this was my first time to climb a church bell tower (and two at that at each end of the facade). The towers were approached by first climbing a steep stair from the nave to the choir loft and, from there, another less steep stair, but with a very low opening, to the towers. The left belfry has two medium-sized bells bells while the right belfry has two big and older (circa 1888) bells and a small bell. One of the newer bells had a recognizable signature stating that it was cast in 1920 by the Hilarion Sunico Foundry (the foundry has made 176 bells since 1872 and its last known bell was cast in 1937). 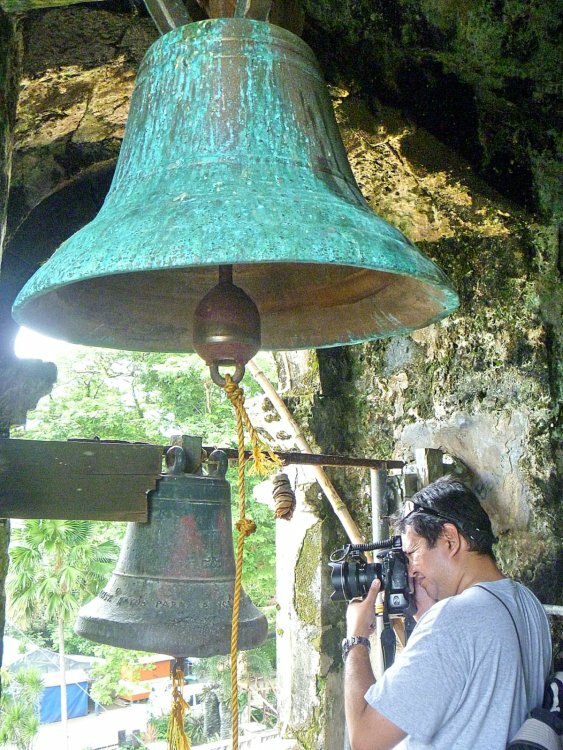 Some of the bells have visible cracks and all are colored blue-green possibly due to oxidation. The towers had panoramic views of the municipal hall and town proper as well as the mountains beyond. About 15 kms. out of Daet, we again made a short stopover at the busy, 648.84 sq. km. (more than 25% of the province’s total land area) and first-class municipality of Labo (2010 population: 92,041, the province’s most populous) where Bernard and I bought some shades at the market. From the market, I walked over to the nearby Church of St. John the Evangelist & Apostle and the modern, 2-storey municipal hall for my own photo ops. The church has a 2-level, coralstone facade with a triangular pediment with a centrally located, semicircular arched statued niche and topped by a square bell tower. The lower level has a centrally located main entrance with semicircular arched and flanked by fluted pilasters and semicircular arched statued niches.